Enjoy any of our three private infrared sauna suites where you can sweat out the stress and pain. Sweat on the healthy glow. Recover faster. Heal from the core with a deep detoxifying sweat. Why do people choose the healing power of sweat? Around here, this is the preferred sauna experience! Lay back and relax in our favorite dome infrared sauna. Be completely enveloped in heat, taking in all the benefits with your head outside the dome to breathe cool air. The dome also gives you control over your sweat. 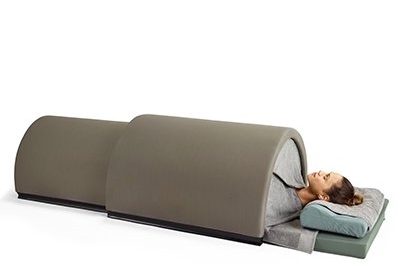 The dome slides allowing you to control how much of your body is in or out of the pod at any time. 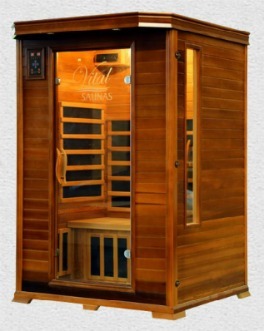 This sauna allows those with respiratory issues to enjoy a sauna treatment unlike the box sauna. We have a single dome sauna room and a tandem / couple sauna room with two domes should you want to share the experience. This full spectrum sauna is spacious and has both near, mid and far infrared waves. This sauna gives an immersive treatment where you have full control over the sweat experience. While this sauna can fit up to two people, it is most comfortable for one to sit back and enjoy the heat. There is an auxillary input available if you'd like to play music or listen to a podcast through the sauna speakers. we provide a standard aux cord, but you are encouraged to bring your own. Cardiovascular Issues or Diabetes - Individuals with a medical history of heart disease, low / high blood pressure, circulatory problems or diabetes should consult a physician prior to use. Alcohol & Drug Abuse - Contrary to popular belief, it is not advisable to attempt to “sweat out” a hangover. The use of alcohol, drugs or medications prior to a sauna session is contraindicated. Elderly - The ability to maintain core body temperature decreases with age. This is primarily due to circulatory conditions and decreased sweat gland function. The body must be able to activate its natural cooling processes in order to maintain core body temperature. If elderly, operate at a lower temperature and for no more than 15 minutes at a time. Chronic Conditions / Diseases Associated With Reduced Ability To Sweat Or Perspire - Multiple Sclerosis, Central Nervous System Tumors and Diabetes with Neuropathy are conditions that are associated with impaired sweating. Consult a physician before your sweat. Menstruation - Heating of the low back area of women during the menstrual period may temporarily increase menstrual flow. This should not preclude sauna use. Joint Injury - Recent (acute) joint injury should not be heated for the first 48 hours or until the swollen symptoms subside. Joints that are chronically hot and swollen may respond poorly to vigorous heating of any kind. Pacemakers / Defibrillators - The magnets used to assemble our saunas can interrupt the pacing and inhibit the output of pacemakers. Please discuss with your doctor the possible risks this may cause.